Food companies use lots of unhealthful and dodgy ingredients to extend shelf life, add gaudy colors, and make us crave their products. You can (and should!) steer clear of these toxic, tacky ingredients to protect your family’s health. When enough of us say “no way,” these food companies will get the message and clean up their act. What it is: MSG is an amino acid used as a flavor-enhancer in processed foods (one of the most common food additives). Why It’s Bad: It’s an known excitotoxin, which is a neurotoxic chemical additive shown to harm nerve cells— overexciting them, sometimes to the point of cell death. Regularly consuming excitotoxins like MSG destroys significant numbers of brain cells and can lead to serious health problems, including neurological disorders. (The two other common excitotoxins used in food are aspartic acid (found in aspartame) and l-cysteine, which is used as a dough conditioner.) In addition, regular consumption of MSG has been shown to stimulate the appetite and contribute to weight gain and obesity. AKA: MSG goes by several aliases, such as Hydrolyzed Vegetable Protein, Hydrolyzed Plant Protein, Vegetable Protein Extract, Yeast Extract, Glutamate, Glutamic Acid, Sodium Caseinate, Textured Protein, Soy Protein Isolates, Barley Malt, Calcium Caseinate and Malt Extract. It’s Found In: Processed foods like salad dressings, low-fat yogurt, canned meats, frozen entrees, potato chips, canned soups (including Campbell’s Condensed Chicken Noodle Soup), and flavored crackers (like Wheat Thins, Cheez-Its and Triscuits). What it is: One of the most widely-used artificial sweeteners. Why It’s Bad: Like MSG, aspartame is an excitotoxin. It also is believed to be carcinogenic, and produces neurotoxic effects such as headaches, dizziness, blurry vision, and gastrointestinal disturbances. Aspartame contains 10-percent methanol, which is shown to be broken down by the body into the toxic by-products formic acid and formaldehyde. Formaldehyde is considered to be a potent nerve toxin and carcinogen, which may explain why aspartame accounts for more reports to the FDA of adverse reactions than all other foods and food additives combined. AKA: NutraSweet, Equal, Canderel, Spoonful, Natrataste, AminoSweet, plus others. It’s Found In: Over 6,000 products contain it, including diet and sugar-free sodas and drinks, sugar-free chewing gum, yogurt, breath mints, instant breakfasts, frozen desserts, juice beverages, and gelatins. What it is: This is a highly-refined sweetener in which corn starch is separated from the corn kernel. The corn starch is then converted into corn syrup through a process called acid hydrolysis. Why It’s Bad: Nearly all HFCS is made from genetically-modified corn. It is the number-one source of calories in the US diet, and has been shown to contribute to weight gain and the development of diabetes. HFCS also is a major contributor to cardiovascular disease, arthritis, insulin resistance, and elevated triglycerides and raised LDL cholesterol. In 2009, theEnvironmental Health Journal reported that a study conducted by theInstitute for Agriculture and Trade Policy found mercury in 9 of 20 samples of commercial HFCS. The HFCS came from 3 different manufacturers including popular brands such as Quaker, Hunts, Kraft, Yoplait, Nutri-Grain, and Smuckers. Mercury is a heavy metal and is considered a potent brain toxin. The presence of mercury-contaminated caustic soda in the production of HFCS is common. AKA: Corn sugar, glucose/fructose (syrup), high-fructose maize syrup inulin, iso-glucose, and fruit fructose. It’s Found In: Soda, salad dressings, breads, cereals, yogurt, soups, lunch meats, pizza sauce and condiments. On average, Americans consume 12 teaspoons of HFCS per day. What it is: There are many different kinds of commercially-refined vegetable oils, including soybean oil, corn oil, safflower oil, canola oil, and peanut oil. Why It’s Bad: Refined cooking oils are made by intensive mechanical and chemical processes that extract the oil from the seeds. The refining process also utilizes chemical solvents and high temperatures. The oils are then typically deodorized and bleached. This process removes the natural vitamins and minerals from the seeds and creates a product that has been shown to become rancid and oxidize easily, causing free radical formation. These oils are also high in Omega-6 fatty acid, which is inflammatory and neutralizes the benefits of Omega-3s in your diet. The oxidation effect has been shown to contribute to inflammation in the body, DNA damage elevated blood triglycerides, and impaired insulin response. Additionally, many refined vegetable oils are hydrogenated. This process creates trans fatty acids, which are known to contribute to heart disease and some cancers. It’s Found In: Many, if not most, processed foods such as crackers, granola bars, and baked goods use these vegetable oils. They also are popular as stand-alone products (i.e., cooking oils and margarines). What it is: If your food isn’t naturally colorful, these additives tint them much like the dyes that color clothing. Why It’s Bad: Artificial food dyes were originally synthesized from coal tar — and now they are derived from petroleum. They have long been controversial, and are one of the most widely used additives in food products today. Many dyes have been banned because of their adverse effects on laboratory animals. Studies have confirmed that nine dyes currently approved for use in the US raise the following health concerns. According to the Center for Science in the Public Interest’s (CSPI) study on food dyes, “The three most widely used dyes, Red 40, Yellow 5, and Yellow 6, are contaminated with known carcinogens. Another dye, Red 3, has been acknowledged for years by the Food and Drug Administration to be a carcinogen, yet it is still in the food supply.” CPSI further reports that these nine food dyes are linked to health issues ranging from cancer and hyperactivity to allergy-like reactions. A large-scale British government study (published in 2007in the UK medical journal Lancet) found that a variety of common food dyes, as well as the preservative sodium benzoate, increased hyperactivity and decreased the attention spans of children. These additives were shown to adversely affect children with attention-deficit hyperactivity disorder (ADHD), along with children having no prior history of behavior problems. The European Union (EU) has put labeling regulations in place to inform consumers of the health risks, but the US has failed to follow suit. AKA: Caramel color, FD&C Blue #1, Brilliant Blue FCF, Bright blue, Blue # 2, Ingtotine, Royal Blue, Red Number 3, Erythrosine, FD&C Red No.40, Allura Red AC, Yellow 5 and 6, FD&C Green Number 3, Fast Green, Sea Green, to name a few. It’s Found In: Beverages, candy, baked goods, cereal, energy bars, puddings, jams, bread, macaroni and cheese, deli meat, frostings, condiments, fast food, ice cream, sherbet, sorbet, plus meat and fish (to make them appear “fresher”). What it is: Butylated hydroxyanisole (BHA) and butylated hydrozyttoluene (BHT) are preservatives used in many foods to prevent oxidation and extend shelf life. Why It’s Bad: BHA and BHT are oxidants, which have been shown to form potentially cancer-causing reactive compounds in the body. The International Agency for Research on Cancer, part of the World Health Organization, considers BHA to be possibly carcinogenic to humans, and the State of California has listed it as a known carcinogen. Where It’s Found: In packaging materials, cereals, sausage, hot dogs, meat patties, chewing gum, potato chips, beer, butter, vegetable oils, cosmetics, and animal feed. What They Are: These two closely-related chemicals are used to preserve meat. Why They’re Bad: When added to meat, the nitrates are readily converted to nitrosamines, which are associated with an increased risk of certain types of cancers. This chemical reaction occurs most readily at the high temperatures. In a 2007 analysis, The World Cancer Research Fund revealed that eating 1.8 ounces of processed meat every day increases your cancer risk by 20%. They’re Found In: Cured meats, bacon, ham, salami, corned beef and hot dogs, pate, pickled pig’s feet, canned meat (Vienna sausages, deviled ham), smoked salmon, dried fish, jerky. What it is: A form of bromide, it is used as an additive to increase the volume in some breads, rolls, and flours. Why It’s Bad: It has been shown to cause cancer in animals and is banned in the EU, Canada, and several other countries. The FDA, since 1991, has requested that bakers voluntarily stop using it. It is rarely used in California because a cancer warning is required on the label. Bromide is considered to be an endocrine disruptor. It’s Found In: Most commercial baked goods in the US, including Wonder Bread, Sunbeam, Home Pride (but not in Pepperidge Farm, Arnold, Entenmann’s, and Orowheat brands). It’s also common in flour, and occurs in some toothpaste and mouthwash brands as an antiseptic. What it is: Produced by Monsanto, rBGH is a genetically-engineered version of the natural growth hormone produced by cows. It is used to boost milk production in dairy cows. Why It’s Bad: “rBGH milk” contains high levels of insulin-like growth factor (IGF-1), excess levels of which have been implicated as major causes of breast, colon and prostate cancers. rBGH milk is not required to be labeled. Giving cows rBGH has been shown to increase the incidence of mastitis. When a cow has mastitis, pus and blood are secreted into the milk. It also leads to antibiotic resistance, which is tied to the spread of virulent staph infections such as MRSA. Hormones in food have also been linked to the onset of early puberty for girls. Consumer feedback spurred such megabrands as Dannon and General Mills, and the supermarket chains Wal-Mart, Starbucks, and Publix to phase out products with hormones rBST and rBGH. AKA: Recombinant bovine somatotropin (rBST). What it is: This highly-processed sweetener is derived from the agave (cactus) plant. Most agave sold in the US comes from Mexico. Why It’s Bad: Many consumers believe agave syrup is a healthful sweetener, but it’s anything but. Agave nectar contains the highest amount of fructose (55-97%) among all the commercial sweeteners, including HFCS (which averages 55% fructose). Fructose has been shown to increase insulin resistance, the precursor to Type 2 diabetes. It is mainly broken down in the liver and then converted to fat. Excessive fructose, when consumed in quantities greater than 25 grams a day, has been shown to elevate uric acid levels, which causes chronic, low level inflammation throughout the body. It is also a main cause of fatty liver disease. Fructose consumption also leads to weight gain, elevated blood sugar and triglycerides, plus high blood pressure. 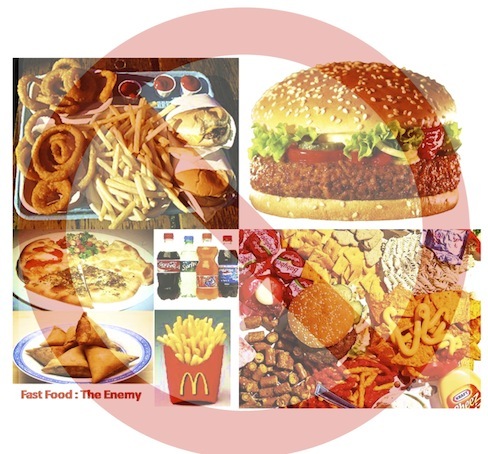 It’s Found In: Ice cream, energy bars and cereals, ketchup and other sauces. Agave is also sold as a stand-alone sweetener. This way, the first ingredients looks like “whole grain wheat” when, in reality, the cereal might be over fifty percent sugars! • Shop at your local farmer’s market, food co-op or CSA. • In the USA, look for the USDA Organic label on foods. This is more often than not a legitimate claim to being certified organic. It’s one of the few programs run by the USDA that actually has integrity. • Read the ingredients labels! If you see names of chemicals you can’t pronounce, don’t buy it. The fewer number of ingredients an item has, the more natural and healthy it is. This is certainly not a complete list of all the unhealthful ingredients in commercial foods today, but these are the ones to avoid like the plague. If you have other nominees, please add them here in the comments below. “Voting” with your dollars is a powerful and immediate way to influence the quality of food in the supermarket. The more you vote, the faster things will change!